With the more endowed nations constrained by their own higher technological capacity for self-destruction as well as by self interest, war may have become a luxury that only the poor peoples of this world can afford. It’s easier to kill a million people than it is to control a million people. Moreover, as America becomes an increasingly multi-cultural society, it may find it more difficult to fashion a consensus on foreign policy issues, except in the circumstance of a truly massive and widely perceived direct external threat. 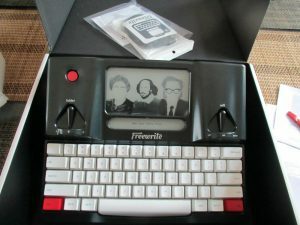 I (or, rather, my hubby) was one of the early backers of the Freewrite, back when it was known as the Hemingwrite. It’s been a bumpy year and a half, but my machine (a belated birthday present) finally arrived late last week. It’s a nice bit of kit and the keyboard is a joy to type on. But, as a past IT Project Manager who has a husband who was also an IT Project Manager, if there’s a case study of how not to do software, the Freewrite is it. Firstly, there is an SDK (Software Development Kit) with the Freewrite, so that means that the creators are opening up the architecture for future tweaks. This is good. But I can’t help feeling that the creators are using the SDK as a way of dodging their own responsibilities.